21. 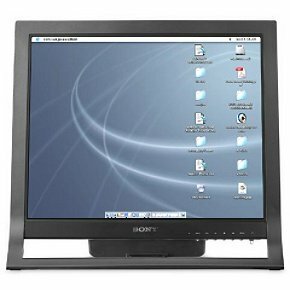 Sony MFM-HT75W Widescreen 17"
36. LG Flatron L1980U Ultra Slim 19"
An outstanding multimedia solution from Sony! My display is being put to dual use in a Windows XP / Macintosh OS X setup.It works greats in both environments. The picture is crisp and fluid at the same time, meaning that text looks sharp while pixilation is indiscernible when viewing high quality digital photos. With the PC: The display is set at 1280 x 768 resolution and is truly excellent. With the Mac: I use this display with my Apple iBook.Initially this caused a problem with the fact that the iBook does not output in widescreen format.I downloaded a fix to my iBook called "Screen Spanning Doctor" at http://www.rutemoeller.com/mp/ibook/ibook_e.html (WARNING, do not select the "clamshell" option during initial setup as this will not allow your iBook to properly dissipate heat during use and can cause serious damage to your iBook). Now I can display my iBook in widescreen at 1280 x 768 resolution. The truly awesome feature of this display however is that I do not have to switch any cables around.You can hook up a computer with an appropriate video card to the DVI connection port, a laptop to the standard VGA port, cable TV to the 75-ohm VHF/UHF coaxial port, standard or Super Video VCR or camcorder to the Standard/S-Video port, and your HD receiver / Satellite receiver / Progressive-Scan DVD Player to the Component video port.You can easily switch between all of them using the supplied Sony infrared remote control (RM-333). There is even Picture-in-Picture so you can watch TV while your working on the computer without over-taxing your computers processor and video card. Sound quality is very good using the three internal speakers (2 stereo & a sub-woofer) if set to SRS WOW. Sometimes the benefits of technology are hidden.Other times, theyre easy to see. Thats definitely thecase with the sharp, bright Samsung 715V LCD monitor.Its flat 17" screen features a high 500:1 contrast ratioand 1280 x 1024 resolution. Exclusive MagicBrightand MagicTune screen technologies give you abrilliant picture that you can fine-tune to yourspecifications. Text is crisp. Graphics are sharp andcolorful. And a 150/120 viewing angle makes sureyou can enjoy the 715V from virtually any point of view. The best monitor available in the market. I did a lot of research and found this monitor has the best quality and look. It is very easy to setup. I liked this monitor so much that I bought two. I have always had picky eyes and always wanted an LCD on my desktop but could never deal with the image quality. Then this monitor came along, very bright, colorful image that no one can be unhappy with. When I first saw this monitor in the store I could not believe it was an LCD because of how bright the image is. This along with the neat tilt design makes the monitor outstanding. WOW! This is a really nice monitor and extremely easy to install. Two power cords and boot up and Windows 2000 found its own set of drivers for it automatically during boot up. Lots of options when fine tuning the visual output settings. Movies and videos look really fine on this bad boy! Highly recommend! Reasonably priced and sleekly designed, the ViewSonic VE-710 is a great choice for both home and workplace applications. Featuring up to 1,280 x 1,024 resolution (for both PC and Mac), a sharp 450:1 contrast ratio, and 300 nits of brightness, images are crisp, clear, and bright enough for viewing under everyday lighting conditions. The VE-710 also features a fast video response time (25 ms typical) to ensure that motion video and action-packed games are smooth and flicker-free. This active matrix LCD offers wide 140-degree horizontal viewing angle (130 degrees vertical), letting you share and inspect onscreen graphics without having to crowd viewers immediately in front of the monitor. It features a unique 90-degree fold-up base design for easy wall-mounting. The panel by itself is just 2.2 inches thick, so it has a very slim profile no matter where you place it or how you configure it. An anti-glare coating reduces glare and the resulting eye fatigue. Customizable settings include image adjustments, color controls, and menu language choices; these are accessed through an intuitive onscreen interface. ViewMatch color adjustments let you calibrate your settings to match a number of industry color standards (sRGB, 9300K, 6500Kdefault, 5400K, RGB). OnView controls also include an OSD lock that prevents accidental changes to your settings once you've adjusted them to your liking. The ViewSonic VE-710 has it's own internal power supply with hard power switch. It comes with a handy installation CD-ROM that automates the installation process and automatically configures settings for optimized performance. It is backed by a three-year warranty on parts and labor. I bought this one for my home computer and it made my old monitor look like it was cheap.This is an outstanding monitor.I am very pleased with it and if you got one you would be too.I would recommend this one over sony or any of the others. I got this monitor for my office and it is amazing.I used to use a 14 inch screen that my laptop had with it and I have to say, this is an immense improvement.The resolution it handles (1280x1024) is much better than the one my laptop displayed (1024x768). The colors are bright and sharp and the styling of this monitor is great.Real slim frame and it looks very high tech. 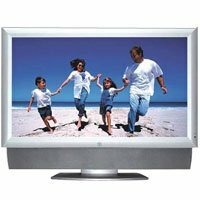 I bought this monitor for my Apple Power Mac G5 and it has been wonderful to own it. 30 inches of beautiful viewing and this is a perfect screen for playing games on. You really do have to go all out on this one because it costs almost or the same as the Power Mac G5 at around $2,999.99 which is extremely expensive but it really isn't too expensive for a LCD monitor at this size. The styling Apple did on this monitor is similar to the PowerBook and it looks amazing. You can use this monitor on Windows computers too. It has 2-Port USB 2.0 Hub Built-In and a 2-Por FireWire Hub Built-In right in it! Native Resolution of 2560x1600 pixels. I think this works the best of G5's but I guess you can use it on any computer you like. I would recommend this display to you because it has everything you need. Check it out! Just wanted to let everyone know that it's been confirmed with multiple owners that the Asus V9999 Gamer Edition based on the 6800 (not GT or Ultra) supports the optimal 2560x1600 resolution. 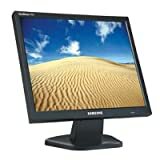 This monitor works great on Windows XP with an NVidia Quadro FX 4000.If it's in your budget, buy it today.There is no downside to this monitor.I have no reservation in recommending it.It is one of the most expensive monitors on the market but I consider it an exceptional value.Everyone who has seen the monitor is stunned by the size, brightness, quality and response time. I just recently bought this display and what an absolute masterpiece.I was using a Samsung 213T and this was to replace that monitor and become my main screen.The 213T is now a second screen for other tasks.If you can afford this monitor, I highly recommend it. Money well spent, even if you don't quite have it. I've always been a huge proponent that the display is a critical component of human-computer synergy.The size of the display is essentially the computer to human information bandwidth of your system (and that system includes you).The larger the display the more bandwidth and the more efficient complex tasks can be.Situational awareness is vastly increased by having all relevant panels of design/video/audio/Flash/3D/CAD/software-development apps all visible at the same time.Bumping the CPU speed by another 50% will never provide that kind of efficiency boost - it has to come from having a better visual interface. And this monitor delivers that via gobs of beautiful pixels.I previously worked on a 23" cinema and going to the 30" made a huge difference.You have space to work, spread out, not have every square inch of your workspace cluttered.You can run Final Cut Pro with the displays at 100%, a huge timeline and have a little iTunes window.A bit of breathing room, finally. I bought a Samsung flat-panel LCD television in March, and it the panel went dead in April.I brought it to a one of Samsung's certified dealers for repair, and waited and waited. Finally in May, I was told that the the television panel was indeed defective and couldn't be fixed, so the manufacturer was obligated to replace it under the warranty.It's now September, and guess what, I'm still waiting for the replacement.Buy from Samsung at your own risk.From my own experience, Samsung does stand by their products. For a few dollars more, buy one of the better, more reliable brands. I have had the 240T for over a year now.It is flat out the best monitor one the market today.1920x1200 over DVI gives razor sharp text, the backlight is super bright and completely even and the colors are stunning.It has such a high pixel frequency that there is never any streaking when playing games.HDTV is awesome on it.Hook up a MyHD card with DVI and enjoy full resolution HDTV. Everyone who comes over to my house cannot believe how nice it is (and most of my friends are computer geeks). Trust me, 5 minutes after you pull the 240T out of the box you will forget how much you paid for it. Until I put the Samsung 240T on my desk, I had thought I could never have a monitor that was too large.Now I'm not so sure.This monitor's physically wide enough that if I position it as close to me as I'd position other LCDs, I actually have to swivel my head to view the whole screen.And the pixel pitch (size of pixels) is wider than I was used to on my IBM A21P Thinkpad notebook (1600x1200 resolution on 15" diagonal) and on my SGI 1600SW (1600x1024 resolution on 17" diagonal).All in all, the monitor looks better viewed from a little further away than these monitors.The brightness, contrast and viewing angle on this monitor blows away anything else I've ever seen.The panel is absolutely uniformly lit and mine arrived with no dead or stuck pixels. The 1920x1200 resolution is large enough for the highest resolution HDTV (1080, which is 1920x1080 pixels). Contrary to both Samsung's manual and Radeon's manuals, but in agreement with comments on countless mailing lists, both the Radeon 9000 and 9700 Pro models with 128MB memory were able to drive this monitor at full 1920x1200 resolution with DVI.The difference between DVI inputs and VGA inputs is night and day, with DVI being far superior in terms of sharpness.The S-video inputs are quite reasonable, and TV images look as good on this monitor as on other analog TVs, and provide a means to play VHS from from VCR without needing S-video inputs on my computer. But DVDs look much much better when played on the computer's DVD player through a decent progressive software decoder like WinDVD coupled with the graphics card's built-in rescaler.In fact, it's one of the best DVD images I've ever seen.To get the best sound, I take the computer's S/PDIF digital output directly into my AV receiver, thus bypassing my computer's sound card entirely. Sonys SDM-S204/B Flat Panel LCD offers maximum performance with UXGA hi-resolution panel combined with a slim bezel and small footprint for the home or office. This display is customized to meet the demands of todays environments with ease of use features and energy saving design. Sony displays; designed for human performance. 20.1 High Resolution LCD Panel: UXGA 1600 x 1200 panel provide hi-resolution performance for almost any application. Digital and Analog Inputs: Triple inputs provide support for multiple computers, digital connection provided for best performance. Super-Thin bezel design: Desktop savings; mount one or tile many for maximum productivity. ErgoBright technology: One-touch brightness and contrast control optimizes image performance and saves energy. ErgoStand design: Convenient ergonomic set height stand with tilt adjust allows for more comfortable viewing position. Internal power supply: Built-in power brick for easy wall/arm mount and space savings. Cable management system: Convenient cable control for easy installation and clean desktop. Premium image quality: Auto ImageSet technology optimizes picture for consistent performance. I bought this monitor in April 2004.It broke December 19.It started going to sleep in November and then on December it went permanetly black.The paper work needed by Sony inorder to send a replacement (refurbished) monitor was faxed and recieved by Soney that day.After many calls to Sony and promises of prompt replacement still nothing almost a mounth later.With warrenty service like this you should count on keeping a back up monitor ifyou buy a Sony.At the time we were in the market for a wide screen plasma TV.We got one but it was a Pioneer not the Sony we were looking at. 1. Bright and contrasty. ViewSonic model scores worst although its spec says differently. 3. Lots of connectors available, two VGA connectors, one DVI. You can switch between them easily. THis make multiple PCs situation much easier since you don't need to buy extra monitor switch (and monitor switch tends to have display quality issue when resolution is 1600X1200). 4. It even has a small slot for laptop lock use. If you are worried about theft of the monitor, this feature is very convenient. 5. All control buttons are located at the right side of monitor. They are black (the same color as the monitor board itself) so they don't distract your attention during operation. 1. Resolution is 1600X1200. Although its screen size is big, at this resolution, font appears to be too small to view. This affects almost all applications on Windows. Although you can tune Windows font size, but it does not apply to every application. And tuning each app is a major hassle. I actually like this monitor to have a native resolution of 1280X1024 so screen font is big and easy to read. Adjusting your computer's setting to 1280X1024 is not an option since the resulting blurring effect will drive you nuts over time (the screen has to stretch certain points to display in a lower resolution). This monitor is expensive, but the resolution, crispness and lack of ghosting make it worthwhile if you can afford it. One cool feature that isn't really mentioned is that it has 2 analog vga inputs and one dvi input, which are all selectable. This is a very nice, high end monitor. I would recommend it if you have the funds. I have to admit that this is a very fine and beautiful monitor. The display is very crisp and vibrant and the 1600x1200 resolution on a 20" monitor is definitely worth the hefty price tag. 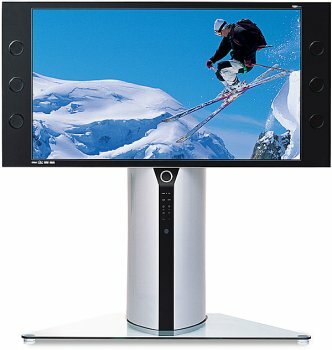 I purchased one of these monitors and after two months dead pixels began appearing right in the center of the monitor. Of course, two months is usually longer than the period you have to return the product to your retailer for an exchange (hopefully no questions asked) without having to deal with Sony. Anybody who has used an LCD monitor with dead pixels can empathize with how frustrating they can be, especially dead pixels located in the center of the monitor. Yes, they're usually only visible on full color surfaces, and there are only one or two, but I would ask you to consider how much time your screen is being used for word processing, programming, or editing graphics. The probability is high that your screen is a solid color (white) for a considerable amount of time, during which these dead pixels are definitely noticeable and very distracting. The warranty that comes with the monitor states that all parts and materials of the monitor are covered for three years if it is deemed defective. Unfortunately, I believe their definition of "defective" does not align with the consumer's. I would argue that if a pixel does not light, it would be called defective. 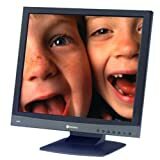 A monitor is comprised of several pixels, therefore it is considered a part of the monitor. Without the pixels, the monitor would be rather useless, don't you agree? For whatever reason, defective pixels do not constitute defective material... unless there are several of them. I think it's analagous to having your car painted and returned with a visible scratch, but not being able to have it repainted because the scratch is not "big enough". If you call Sony to have your monitor fixed or replaced due to bad pixels, they will NOT replace it. Instead they will give you some P.R. line about the incredible technology used to manufacture these monitors (blahblahblah) and therefore it is okay to have dead pixels and even though some don't work, they are not defective. Whatever reason they give you, I guarantee you won't care. According to Sony, your monitor is not defective and it will not be repaired or exchanged (even if you paid $1200 for it). They will go on to tell you that most people who have dead pixels rarely even notice. I don't know if I believe that. Anybody who is considering spending $1200 on a monitor will surely notice and be annoyed by even one dead pixel. All you can do is ask to file a complaint with the company, which means your name gets appended to the list of users with defective monitors. This, of course, means absolutely nothing. I think this kind of treatment is EXTREMELY disappointing, especially considering this monitor retails for around $1150 after tax. The limited warranty does not even mention their policy on dead pixel returns. I would like to advise buyers to research other vendors and find one with a zero-dead-pixel policy, or perhaps investigate smaller and cheaper monitors. This monitor is definitely eye-candy, but the joy you will experience (as expressed by other new owners) will quickly and painfully end as soon as the dead pixels start appear. If you do decide to buy this monitor, be sure to get an extended warranty which will allow you to return it under any circumstance. You could be stuck having paid $1200 for a monitor with dead pixels after a few weeks of use. Not 1 dead pixel, excelent resolution crisp images and no ghost i absolutly recommend this product, but dont forget to buy the DVI cable they make a lot of diference. Not too heavy and nice control panel. I've tried several different monitors and the NEC is by far the best.The color and brightness are excellent and the overall design is very classy.I have yet to find a flaw in this monitor and I highly recommend it.You will not be disappointed. I received this monitor for my girlfriends PC. It is a replacement for a 6 year old 21" Hitachi CRT monitor. I first connected with standard VGA cable as I was waiting for the DVI cable and after a little set up, I was quite pleased with the appearance on the screen. The menu controls are kinda funky and takes some getting use to them. Yesterday, I got the DVI cable and what at difference! The clarity is incredible, the color saturation is very good and the text is very legible. I was concerned about scan frequency as I normally run CRTs at 85 to 100 hertz to reduce flicker and at the 1280x1024 setting the NEC monitor wanted 60 hertz. So I changed the setting to 60 and it is absolutly flicker free. Except for the OSD controls, this is an excellent moniter, but once things are set up, there should be no need to use the OSD. The 1935NXM is a great value 19" monitor.The picture quality is bright and clear.The monitor has 16 msec response time at close to $400 after rebate, a great deal for this screen size.It is also wall mountable!The silver color and blue lighting gives the monitor a modern appearance and looks even better at night.However, some might find the blue lighting on the back of the monitor annoying if sleeping in the same room.The monitor design is very simple, with the bulk of the lcd mounted on a simple base.While common, the design makes the monitor difficult to turn.Also, the features layout is very awkward.The selection menu is configured in a circular layout and one must scroll through either clockwise or counterclockwise to exit, even while simply adjusting brightness or contrast.The menu design is not intuitive and I still have not gotten used to it yet.I prefer to just find acceptable settings and leave it at that.Despite the minor design flaws, the 1935NXM is still a great value 19" monitor. In the past, I've not been a big fan of LCD monitors. I always felt they were behind the curve compared to old fashioned CRT displays. NEC changed my mind. Text is sharp and easy to read, video is clean clear. When browsing the web, colors are vibrant and crisp. The on screen menu takes a little getting used to, but you shouldn't have to use it much since the auto-settings are very good. I wrote this review in January. I have deleted it and lost the points just to add some updates because the review is more important to me. The bottom line is that the monitor is even better than I hoped. NO DEAD PIXILS. NO PROBLEMS... like none, zero. I have found this monitor by far the best bang for your buck. As for going pro and paying more. Go pay more if you want a pro LCD monitor. But to be honest I would put that kind of money into a projector for widescreen movies. If you want an LCD monitor for Counter-Strike, Games, Graphics work, then this is what you want. If you want to present your $100,000 car via video to your client using a 19" LCD monitor in the show room, then obviously go spend $1,000 on a good LCD showcase LCD and not this. Ghosting is there, but to be honest I have seen ghosting on this and the Dell but there is no way to get near no-ghosting effects without spending on pro LCD monitor, period. And we are talking not domestic Sony products that cost a bomb but pro line broadcast products not found on Amazon... i.e Panasonic pro range and Sony Broadcast stuff. The NEOVO range sells like hot cakes and competitor prices differ vastly on this monitor because you can sell it at three times the asking price. Basically this is a 19" whooper LCD that sits next to 15" Sony monitors (at the same price or this is much less) and makes them look like little monkeys. The 17" pro models are usually twice the price but this big screen just gets snatched up because it is so much more in size and so much cheaper than the item next to it, and get this... chances are no dead pixels (anything less than 6 is acceptable as long as they are all not clumped together or something. AG actually has good quality monitors. 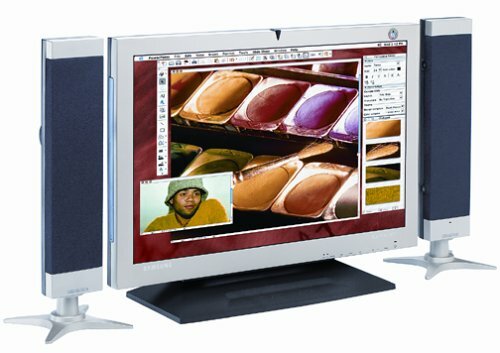 I viewed several of these 19" monitors and have found one with two dead black pixels on white and even I would have bought that if it was the only one left. Seeing monitors is a good idea but AG seems like a good bet on-line judging by what I have seen although I must admit the box felt a little loose carrying it. Turn on any LCD and the room suddenly gets brighter. Same with this model... yes it is an LCD! The actual screen appears to curve slightly inwards, a nice effect with the 19" resolution quality (1,280 x 1,024). A Pro 256mb graphics card set at full acceleration and something like an MX1000 laser mouse and I am sure even pro graphics users would not complain about the neatness of their work. Gaming-wise you will never look at another monitor the same way again. In terms of graphics, I will say that the 19" pro monitors where really nice but a way more expensive. This Neovo beat most 21" CRT monitors, hands down, but there where some 21" inch CRT screens that could still compete with this at a cheaper price. Something to think about... but slim is in and the LCD is pretty much LCD. Of course there are some drawbacks, the monitor does not have a perfectly steady base, does wobble a little more than pro models but does stay standing. You would really have to tilt the desk or hit it hard to knock it over. The pixels are also somewhat harsh if you look at the screen closely and you do see the pixels with clear 20/20 vision which means that it is not really high-end at all except for the size price factor. To be honest the NEOVO F-419 is more like a very high quality 17" LCD monitor on blowup than a true 19" panel. Unless you are doing extremely pro stuff like large 2 meter x 2 meter graphic prints or telecine 35mm motion picture film CGI which requires higher resolutions like 1600+, meaning popping the extra (triple the price) for a pro 19" model then undoubtedly you will have a more superior 19" LCD with a higher resolution and probably everything else. No one is going to disagree with you there, but those who have spent money on pro 19" monitors are going to want to keep them for at least five or six years minimum at those prices. Next deal next decade? The F-419 is not cheap but let's face it - I can retire it in three years time from now and feel I got some use for it. Would certainly buy AG again. However the 19" blowup effect of a high quality 17" monitor makes this thing unstoppable except for those with bigger wallets. Viewing high resolution scans is like a new experience. Playing Half-Life 2 just improved the game like x 100 even though the ghosting on this monitor is a little more noticeable than the pro models but beat any 21" CRT hands down because it is LCD. In short, budget LCD is here. 15" and 17" forget it... why waste the money? Get this 19" or go 19" pro or better for higher sums. 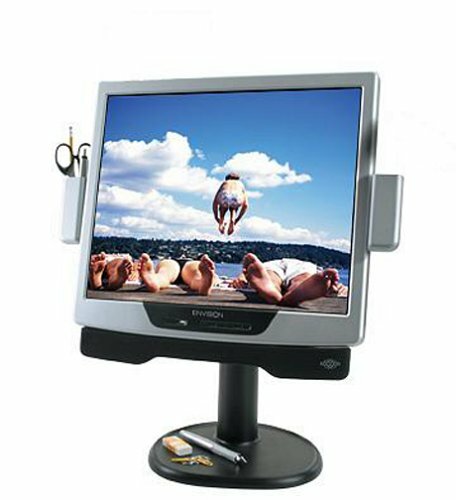 -	Best buy LCD monitor at this time. -	Not a true 19" LCD. -	Probably under par in every department for a 19" LCD except for all working pixels. -	Ghosting a little stronger than the next $100 model but $100 does not buy you no ghosting (however to be honest there is no monitor like this at the price). I have this monitor for about 2 weeks now, the 700:1 contrast stats along with the digital input deliver wonderful 19 inch real estate that is great for video's and pictures. I bought this 19 inch LCD display on "price" but also because I wanted a digital (DVI) connection (it also supports an analog connection as well)and I feel as though I gave up nothing and got a great LCD display at an even greater price. I was a little nervous about buying this monitor without actually seeing it first. I read the other reviews and took a chance. This is one rockin' monitor. My eyes feel better already. Bright, clear, and crisp are just a few words to describe this unit. I know my wife will want one now that she has seen it working. It's 25ms response time, not 15ms.Don't be fooled! I bought this LCD display from Amazon a few weeks ago. It was well packed and no dead pixles on it. As other guys mentioned, it is bright and clear. However, it has a big problem, which is the slow rising time. The product's specification list here is not the same as I found later in agneovo's web site. They advertised a slow 25ms(15ms rising/10ms falling) response time product to be a fast 15ms(5ms rising/10ms falling) response time one. This is really dirty. When you move the mouse arrow aross a black background, the white mouse pointer becomes brown during the movement. And you can see the black text becomes grey or red text when you scroll a web page like this one. My old Dell 15 never acts like that and it is not supposed to be like that. Purchased this Westinghouse one month ago.Delighted daily by picture quality and detail of high definition programming (720p or 1080i) delivered through DVI cable.DVDs via component cable not quite as crisp and three-dimensional because only 480p, but still theatrical, bright with richly-saturated colors.Standard definition programming delivered through digital satellite via DVI very watchable.Audio adequate, although a surround-sound system is preferable.Remote-control simplistic but fully functional, although codes don't seem to exist for universal remotes.On-screen display menus very intuitive, and offer unusually great amount of control over image (brightness, contrast, saturation, hue, etc.). The 19-inch 193p from Samsung, an active matrix TFT LCD monitor with a small footprint and a number of useful extras, provides a high-quality image, advanced display technology, and a stylish design. Perfect for both home and business users as well as graphics professionals, the 193p delivers true-to-life images with its 1,280 x 1,024 maximum resolution and 0.294 mm dot pitch. A high 800:1 contrast ratio combines with 250cd/m2 of brightness and 24-bit color support (16.7 million shades) to provide bright, clear images and easy-to-read text. This sleek monitor has a fast 20 ms response time, a 4:3 aspect ratio, a 30-81 kHz horizontal, and 56-75 Hz vertical scanning frequency. The 193p supports VGA analog input signals as well as digital (DVI-D) for advanced graphics cards. With a small 16.7-by-9.3-inch footprint, the 193p fits easily onto any convenient surface and is also wall-mountable (VESA 100 mm), freeing up your valuable desktop space completely. TCO '03 certified, the 193p consumes about 40 watts of power during normal operation and is a plug-and-play ready to use right out of the box. Compatible with both PC and Mac platforms, the 193p also comes backed with a three-year limited warranty on both parts and labor. Besr monniror thar I have ever had!Awesome!! 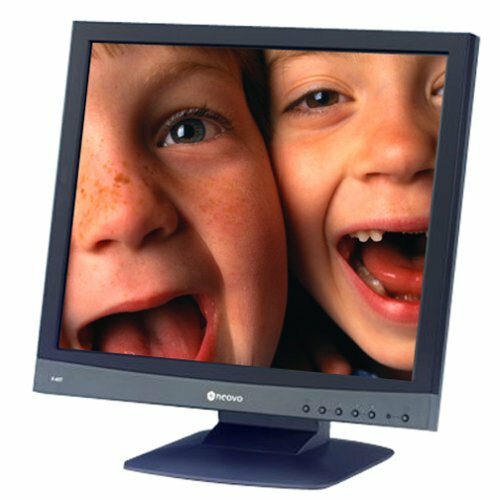 I am an sight impaired individual that was using an CRT that was made by AOC.THe monitor was ok but it was causing a lot of eye strain.So, I researched quite a few LCD monitors and I went to some of the major electronics to preview the displays.As I kept researching and previewing many displays my eyes was always affix on the 193p.I was impressed with the contrast, brightness, and color depth.So, I went ahead and purchased it from j&R Electronics. I received it within a week, connected it to my computer and I was even more impressed!I am enjoying every second of use.I highly recommend this oroduct. This is one of the best monitors at any price, I have mine for 3 months now. Plays DVD & 3D games without any gosting. Beautiful design and perfect display, very wide viewing angle. Full brigtness and contrast adjustment with included software. The bottom line - this display is unacceptable for playing video games or watching DVDs!I am currently running with an ATI Radeon 9800 with DVI to this LCD.When stationary, the picture looks great, however the 20ms response time makes Counter Strike unpleasant, and Far Cry nauseating to play.Turning around inside or outside becomes a blur.The walls on either side of a cooridor becomes a blur when running through.Watching DVDs is very do-able, but during fast sequences, especially when the background is spinning quickly you can't make out anything. Those who reviewed this monitor and said the response time was un-noticable when using the DVI input were wrong.It truly boggles me how they came to this conclusion.This is old technology, and should not be purchased! After reading the reviews on this monitor, and checking other websites, I decided to purchase this Samsung SyncMaster.With the rebates (which I hopefully will receive from J&R) this was an extremely good buy for the quality of this monitor.I can't give the technical input some others have given, but I can say this is all I could want in a monitor.This is the first review I have ever written, but I am so impressed, and thankful for the reviews that led me to make this purchase, that I felt obligated to add my recommendation. 4) View your photos from any digital camera storage card (some with adapters. 2) The range is not very good, it kind of defeats the wireless benefit. 3) The Web browser does not work with every website, like Yahoo and hotmail mail. I absolutely LOVE this thing. I've long wanted a wireless TV I could carry throughout the house. I'd toyed around with analog 2.4ghz wireless monitors but the range was very short and other devices (WiFi and cordless phones) interfered. The microwave absolutely wiped the thing out as well. Such interference is NOT an issue with the LF-X5. Run the microwave, browse the net, talk on the phone and you can still have the TV going without skipping a beat. Note that there's NO difference in functionality between this unit and the larger LF-X1. The X1 has a few more connections and a larger screen but they operate identically. The picture quality is very good and for what it's doing it's absolutely exceptional and setup for use around the house is very easy. Plug the base into the wall, connect up the cable, turn the display on and you're done! No configuration or networking expertise needed at all. Using it with satellite or a cable box will require some configuration which can be a bit daunting. Reading the manual thoroughly will get you through though. My only problem with it when it's used around the house is that the range is noticably shorter than when using a standard WiFi access point. I'm not sure if it's using lower power or if it's a matter of a lack of antennae but the range is somewhat lacking. Outside the house it's another matter. This unit will likely NOT work with a standard broadband connection. It needs at least a solid 384k upstream to achieve decent quality and even 1.5Mbps isn't enough to use the highest bitrates. If your ISP offers high upstream rates this unit will work WONDERFULLY for you. The L1980U black and silver monitor is the slimmest flat screen in its class. With 1280x1024 maximum resolution and .29 pixel pitch and f-engine technology, this monitor features the first LCD picture-enhancing chip to provide and superb contrast and image quality. Plus it has many other features, like heat-sensor power on/off button, DVI-D input, and auto-pivot/mirror function. L1980U LCD monitor from LG. It just doesn't get any thinner than this. If you are not a professional 2D image or 3D graphics high-end user, if you just want a sleek LCD monitor sitting on your desk for general usage, this EN7410 monitor has the best Q/P ratio (Quality/Price ratio) in current market for the 17" LCD monitor category. I use it to do my programming, document editing, Internet surfing, some 3D graphics modeling and first phase photoshop touching, I'm very happy with it. Highly recommended. If you are a high-end graphics user, I recommend at least 19" in size with high color precision. Never having personally used a LCD monitor before, I took the plunge and decided on this one. In general I'm very happy with the results. The color, clarity and response time are great! I see almost no difference between this and my old CRT monitor. My fears of a fuzzy picture were unfounded. Though I never realized that you have to be directly in front of a LCD monitor to get accurate color. If you view it from some other side, strange things happen. But this is nothing I can't live with. There is a strange but insignificant problem. Since I've started with this monitor, I sometimes get Runtime error messages when surfing the internet. That never happened with my old CRT monitor. I can't tell whether it's because of this new monitor. But it's a rare problem, easily brushed aside. The slim size of the monitor is perfect for my tiny desk. Unlike my original HP CRT monitor, which took up more than half the desk. Now I just have to unload that old behemoth. Considering the picture quality, price, and size, this is a great buy. But watch out for the shipping. Originally, Amazon.com said they would ship in 1 to 2 weeks. It took them almost a month to ship. I hope you have better luck. Now that Target is handling the shipping, things may improve. I was researching LCD's for awhile, and really wanted a 19", but they are just too expensive. I found this to be a wonderful deal, $179.99 from CompUSA. The monitor has impressive specs, and most importantly a good a warranty from a good brand. The clarity of text is sharp, and images display vividly. Movies, and games also run great, without any ghosting. I have two computers, and on the first, I wasn't able to run it it's native resoultion which caused text fuziness, before declaring it defective and returning it, I tried it on my other computer and it works fantastic. The amount of space I save over my 19" crt, is amazing. The quality has gone up and the prices are finally coming down on name-brand LCD television sets (unfortunately, this one has gone up 15% since the pre-order price offered by Amazon).Space considerations dictated a unit without the bulky back-side protruberance of a conventional CRT set, so I took a deep breath and pre-ordered this stylish and compact, newest Sony model, which is being pitched as a versatile monitor rather than a "dedicated" LCD TV set. 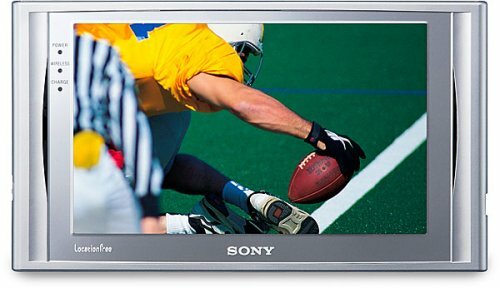 To begin with, the main advantage is the shallow case.If you have room for the old cathode ray model, hang on to it and save yourself a small fortune.That said, this Sony LCD unit performs better than conventional sets in some areas and is of at least equal quality in most others.Its superiority is most noticeable where numbers, titles, and animation are concerned--all are razor sharp beyond my expectations (can't see why anyone would invest the extra money needed to activate the "high-definition ready" feature).Human figures and flesh tones can be a bit more inconsistent than on a cathode ray tube.Occasionally, the contrast is excessive, regardless of how much I tweak the settings.On the other hand, when the signal source is a DVD player or VCR rather than cable TV, the images are crisp and consistent (so good, in fact, I noticed no appreciable improvement when I substituted for the composite cable first an S-Video, then a component video, cable). The set is ready-to-go out of the box, and the remote has minimal but convenient buttons for instantly changing brightness, contrast, and picture size ratios.As for the stereo sound, complete with "sub-woofer" (apparently defined by Sony as a speaker larger than a silver dollar), I wouldn't make purchase contingent on that consideration.The audio is fine, as television sound goes, but I have yet to experience anything out of the ordinary.I tested it with a jazz CD.By boosting treble and bass to the max, I was able to coax from the set undistorted balanced sound with fairly alive cymbals and an audible bass while maintaining an adequately present mid-range. Even when the power is off, the case is understated, trim, and elegant.Moreover, my cat can't jump on it and make it come crashing to the floor, which was the fate of this set's precariously balanced predecessor. I have started to use this with my new gaming computer and i have found it a very nice product.I got it for $340 making it cheaper then the others and also making it a very good buy after spending so much on other things. Not a bad monitor at all! When I first got this monitor I thought the quality was so-so especially when it came to the fonts. Image quality was pretty good but the fact that the fonts were fuzzy really kind of bothered me. I decided to download a utility for my video card that allowed me to make adjustments to gamma and screen resolution. After I made some adjustments to fonts in Windows display properties, I then set my screen resolution to 1280 x 1024 through the utility (not Windows). Once I did that the fonts now look perfect! My Windows screen resolution also says 1280 x 1024 but for some reason setting it through the utility made all the difference. I would suggest that anyone who buys this monitor download the latest driver and utilities for their particular video card and play with sreen resolutions, font sizes and font shadows to obtain the best possible looking fonts. As for the speakers, well, if you don't already have some they will be adequate until you do. I had speakers already and while it would have been nice to remove them from the desk top, they stayed as the quality just isn't there for the built-in speakers. We didn't attach the accessory holders on the sides of the monitor - looks too ugly IMHO. Glad they're not built-in. One more thing - there is a utility included with the CD that allows you to rotate the screen image and then you can rotate the whole monitor screen to view everything in a portrait mode. I kind of liked it that way because you don't need to scroll as much but my wife disagreed. All a matter of preference. Overall a very good monitor for the money. It is nice, not very expensive. Just buy it.I relied on other reviews & bought this & am very happy. Graceful, easy to install monitor. No (NOT 1) dead pixels. Great price. DVI input. Pivots. Height adjusts. Free shipping. 10 minutes from UPS delivery to watching a DVD, and most of that time was spent removing it from the box.Placing it securely on the sturdy base was no problem.Then, I just plugged it in and was good to go.Ease of installation is extremely important to me, because I don't enjoy fiddling endlessly around with electronics to get everything up and running.I want it perfect out of the box, and it was!Plug and Play it promises and absolute Plug and Play it delivers. This monitor gives a flawless, vividly colorful viewing experience with DVD presentations and, as the previous reviewer noted,it is equally clear and crisp with text. Only caveat: the sound quality of the speakers while adequate, does not deliver the strongest audio experience for my taste.However, I bought this monitor for its all-around superior visuals and not its audio capabilities. And since I was planning on using my own speakers anyway, it's not a problem. If you're looking for a hassle-free, bargain-priced 19" lcd monitor that performs as well--or better--than the more expensive competition, buy this. 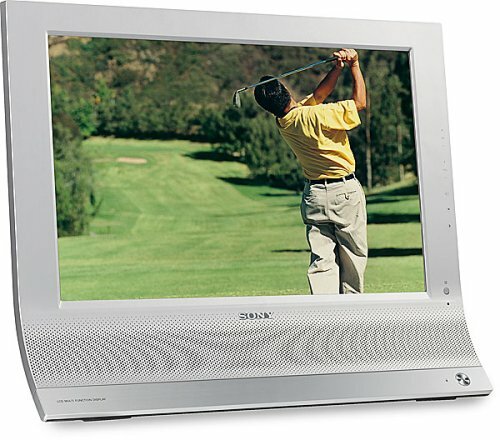 I have the version of this monitor that doesn't include the speakers, so I cannot comment on their quality.Otherwise, my monitor is identical to this one. For a monitor in this price range, it really is excellent.Sharp picture, great color, and even very small fonts look crisp.